We marked the calendars a while back. We were overdue a bikepack. So Dave and I decided on the date. It wasn’t entirely arbitrary; a bit past Mothers Day, but before Memorial Day weekend. The sweet spot. Weather should be good, right? I had a busy week at Siren building bikes and working with enduroheads and their idiosyncrasies, followed by a busy-ish day at The HUB combined with a sick (and tempermental) kiddo. Saturday night came fast… after a glass of wine or two or three at Cafe Aroma. We were to leave at 7 am Sunday and I hadn’t so much as thought about packing my gear, let alone execute the task. I rummaged around in the back room of the house, got most of the stuff I’d needed and realized this chore had become easier with time. Most of my bikepacking gear is always packed, I sometimes liken this to that of a go-bag belonging to an international spy, ready to hightail it at at moment’s notice… but it’s really more telling of my lazy state of mind when I return from a long trip. 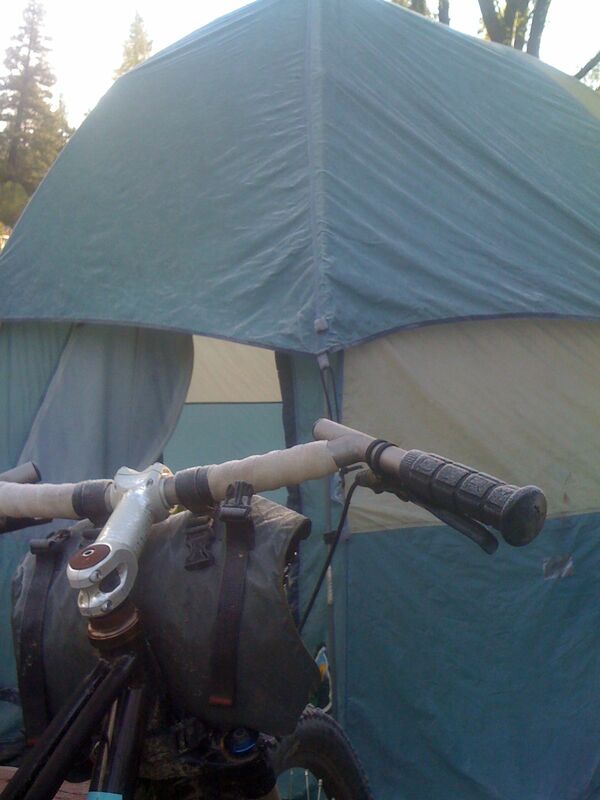 Realizing this, I recalled for the first time in maybe my last 3 bikepacks: the therm-a-rest has holes in it. Thankfully Mary had already offered her down-filled mattress pad for me to borrow. The iPhone weather forecast looked like crap. I packed the 20 degree bag instead of my go-to 40 degree bag. In my haste, I neglected to pack my titanium mug, coffee, and some other goodies, though I didn’t know it until much later. I set my alarm for 5:30 and procrastinated what I thought was a perfectly reasonable number of tasks for the morning. -Alexander didn’t sleep. At all. Sick kiddo. Unhappy kiddo. Tired mom. -Alarm goes off, seemingly a moment after we’d gone to bed. – Mary made some affirmative commentary about my mental health that I’ll moderate here to keep the PG rating. Suffice it to say I felt greenlighted. I called Dave, we left an hour late. 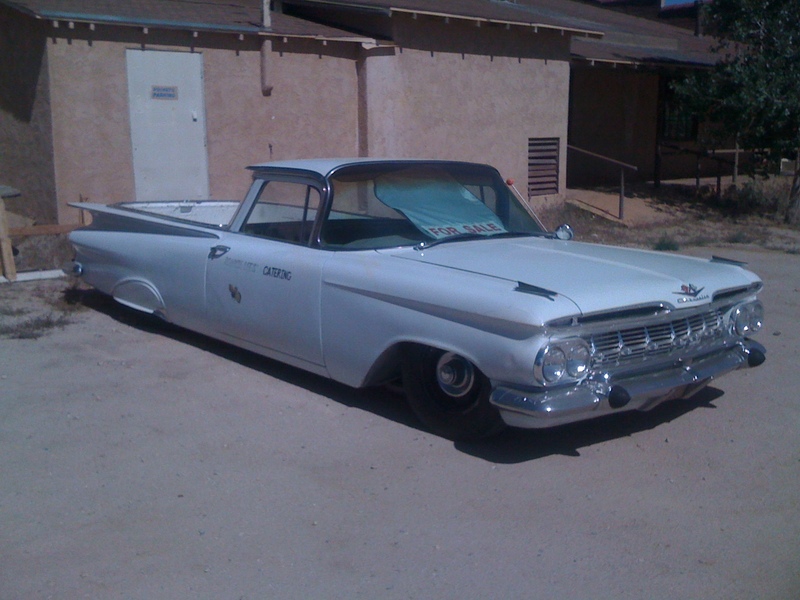 Dave & family drove us out to Pioneertown, where the adventure would begin. I fired off emails from the smartgadget and tied some loose ends. 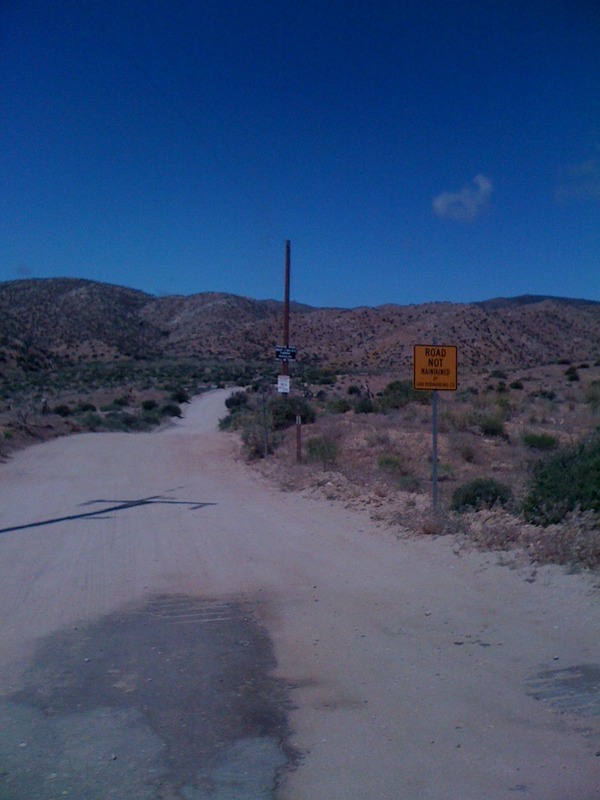 Then, finally, we arrived in Pioneertown. Bikes on the ground. One more text… the kiddo was doing ok. So we started riding. On my request we stopped by Pappy & Harriets to check on my Siren sticker I’d left a couple years ago… when Mary was in her second trimester and kicked our asses on this climb. The sticker was still there, a good omen. On asphalt we rode toward the big mountains looming in the distance. 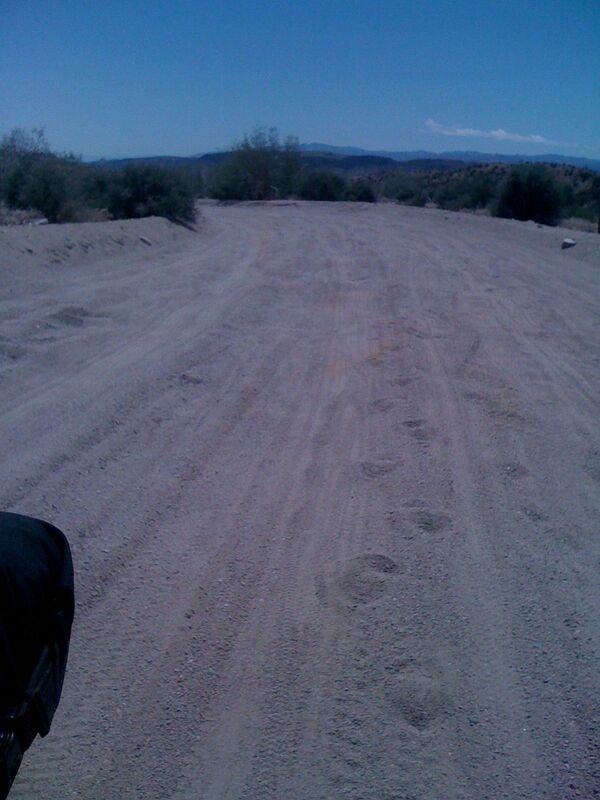 Asphalt gave way to dirt.. sand, really. At this point in the ride I’d started drinking water with purpose. It was getting hot. I found myself admiring the shadows the small junipers and yuccas cast… I felt the heat chasing us up the canyon. We stopped for relief from time time. Back on the bikes, we settled into a groove, pushing a reasonable pace while keeping a decent conversation alive. 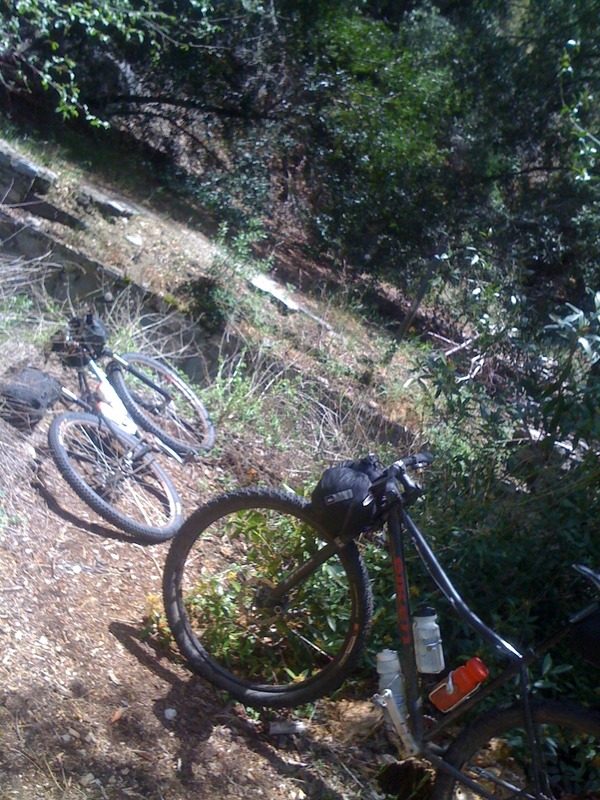 We noticed a pair of mountain bike tracks, fresh ones… eventually we came upon a couple other guys, on bikes, stopped by an old mineshaft opening. They were of hearty stock, decked out in jeans & work boots. One of the guys was riding a bike purpose-built for desert riding with wide rims (biggish freeride size) and an internally geared hub. We chatted for a while and pressed on for Big Bear, they descended shortly thereafter. By the turnoff, the heat that had been nipping our heels had given way to a chilly breeze. We stopped and added layers before coming into Big Bear. Into Big Bear: We stopped at a particularly delicious sandwich shop. An Animal House moment when we walked in and the music seemed to have stopped. Ok, that didn’t exactly happen but I did notice every eye in the place on us at the same moment. The chili was exceptional. The pastrami sandwich I took to go was a lifesaver. We restocked at the little market next door. Red Bull for Dave and a snickers bar for me. Bagels, oatmeal, peanut butter. A couple stoners overheard us discussing the particulars of the next leg of our ride… “I know all the roads around here” one of them interjected. Within moments we were being entertained by two stoney (and fully animated) locals as they described in hyperactive detail the subtle bends, climbs, and turnoffs in the road we’d soon be taking. 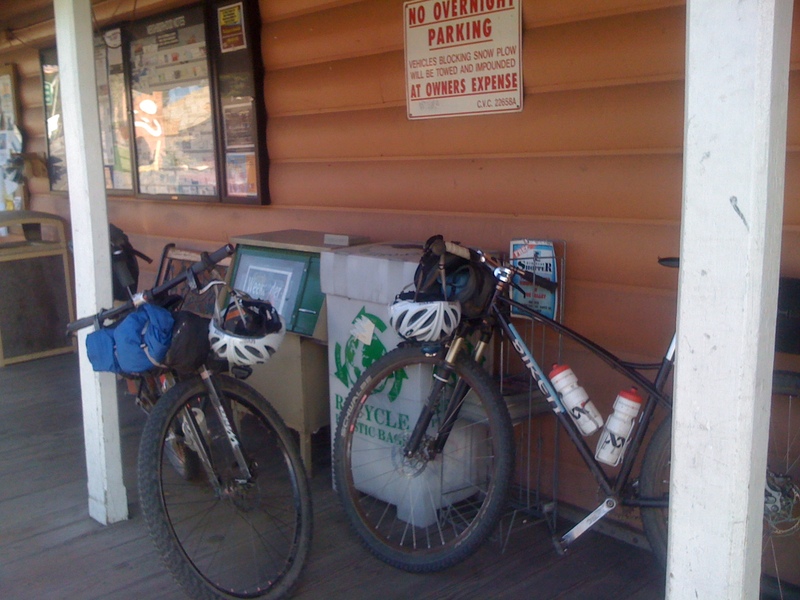 We rode several miles on flat pavement on our undergeared singlespeeds to the far end of town. Contact points sore, neck stiff, shoulders locked. 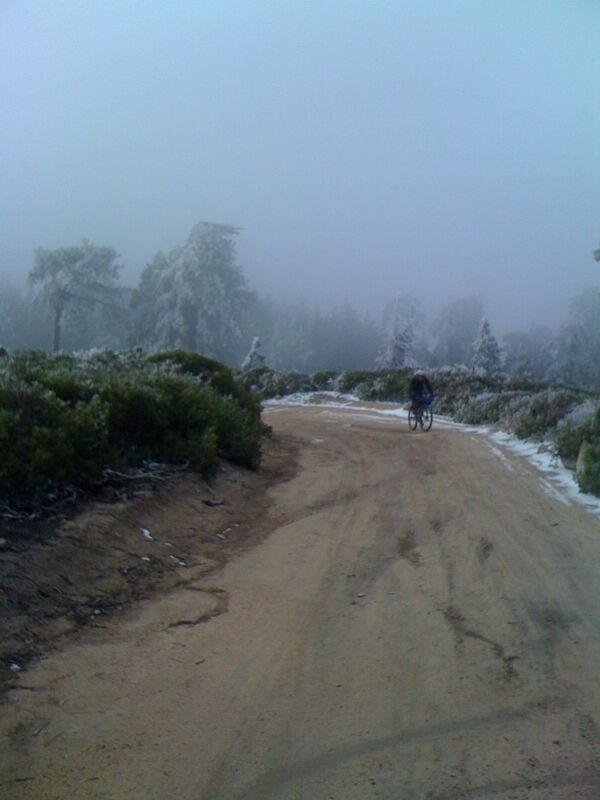 On to the climb, yes, more climbing… up, over, and out of Big Bear. We started the climb with a sense of accomplishment; if we had to ditch at this point we’d be prepared, I figured. We were loaded up and ready for a night in bush, no matter where fate would lead us, I further figured. We climbed on, the sun getting lower in the sky, body soreness setting in. Then we hit the snow. It got cold fast. The snow was fresh, crunchy as we set first tracks. The climb dragged on… on on a bit longer. The quick spin up to Clarks Grade was becoming more a commitment. We hit older snow that had been there for months, and I abandoned the possibility of bedding down “wherever” we wanted; realizing we’d have to push through and descend to lower elevation to more favorable climes. I snapped one last pic before it got *really* cold on us. Last pic before it got *really* cold. Contact points, sore neck, blasted shoulders… stiff legs, runny nose, numbing fingers. Some good time passed before we made our way to the top of Clarks Grade. The wind picked up near the top, it was really cold. Icicle stalagmites shot out from bushes horizontally into the prevailing wind from the south side of the mountain. We stopped and donned nearly every piece of clothing we’d packed for the trip and descended Clarks Grade in thick fog. I whined audibly. We descended very fast and occasionally stopped altogether to warm up our digits. (I couldn’t pull my brakes very well) When we broke down beneath the cloud level we felt what must have been a 10 degree relief, a cause for celebration. We drank bourbon to help get some dilated warmth. Seven Oaks Resort was our destination for the night. I let my mind wander to thoughts of rental cabins, set a threshold price in my mind for which we would make or break the deal… Sunday night, I figured, gotta have something and maybe we can swing a deal. We arrived at Seven Oaks just before dark. The office was closed. I knocked the door on the only cabin that had smoke rising from its chimney. “Anyone have a garage they’d be willing to rent out for the night? A chicken coop?” said Dave, half joking/ half seriously. Nope. While the conversation didn’t yield us a cabin, it did get us a loaner tent, the great big giant kind you can stand up inside of. We were really, really happy about this trail magic. We feasted on leftover sandwiches, chocolate bars, beer nuts, and all sorts of other goodies. Lights out. I woke up often to consume more calories and water, shivering a little. Morning frost on the world’s largest tent. We prepared a small breakfast of oatmeal and bagels. Dave was feeling under the weather. To my fortune, he didn’t want his coffee… and I’d forgotten to pack mine. We rolled out of camp up to the Santa Ana River trail. It had been a long time since I’d ridden it, it was Dave’s first time. We rode a good bit of it, save for some on either end. There were a few trees down, which just put us in our element. We stopped in Angelus Oaks for a proper breakfast; french toast & hot coffee. 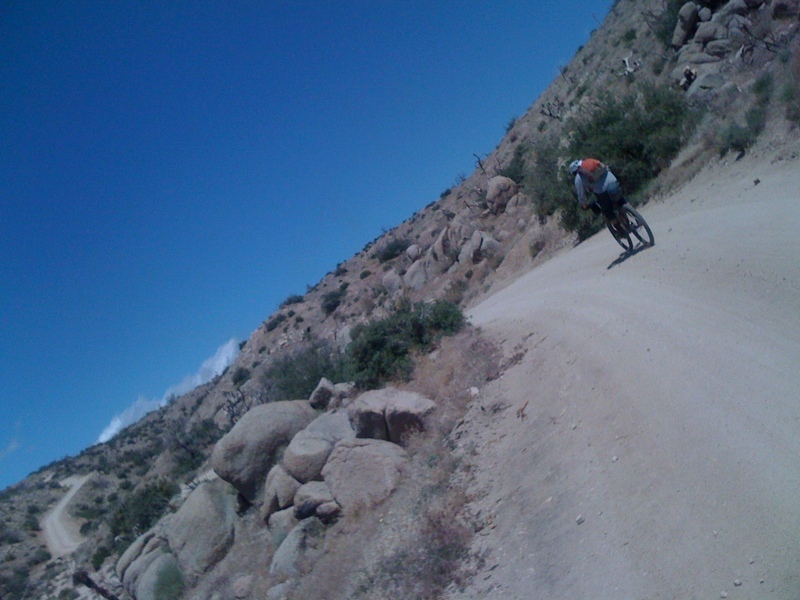 We met a couple from Anza who were setting out on their touring bikes to ride up to Kernville. They were as interested in our route as we were in theirs. Next leg: Old Highway 38. This is an old roadbed, asphalt. Or it was an old roadbed, since slowly turning into singletrack. We hauled the mail down… down… down off the mountain. I could see Yucaipa ridge looming in the distance. Old Highway 38 was really fun. We got to an old bridge that was out, creek roaring below. Ultimately we hit the highway, turned the bikes uphill again, and pedaled. Up, and up. 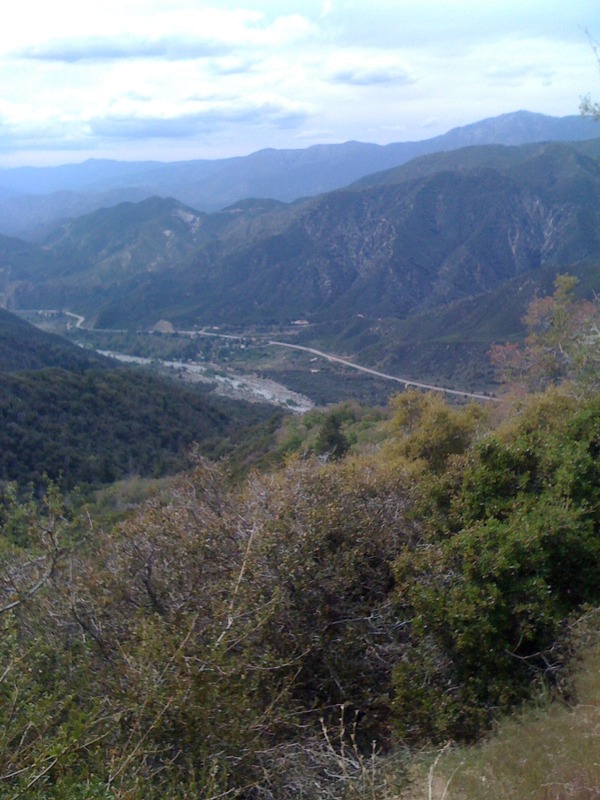 We got ourselves onto the road leading up to Yucaipa Ridge, and pedaled some more UP. And up. After a good long while we once again had the preferable views. 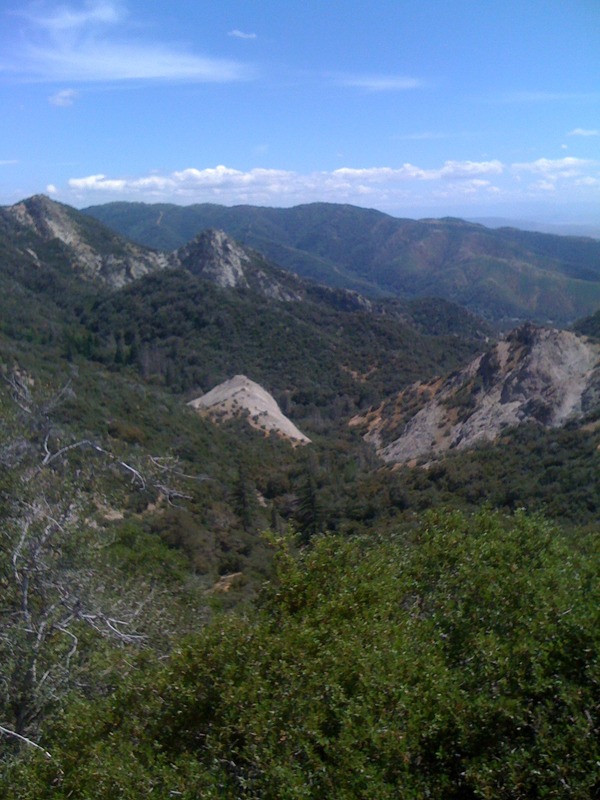 We pushed on (literally) to the saddle… put on some more layers, saw Oak Glen looming below. Margaritas? I entertained the thought. 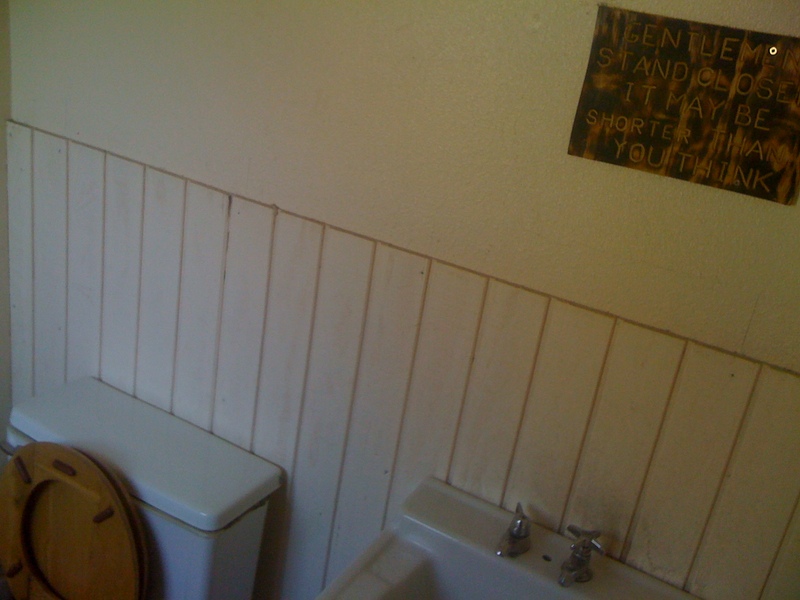 Dave made some noises off the brush; no spirits for him, he was sure of it. Let’s get down. We arrived in Oak Glen at closing time early Monday evening… not a lot going on in the sleepy little town. We stumbled into the restaurant. The waitress was wearing a revolver on her hip. I assume(?) it was not real. She talked with the only other patron about her music choice of the day, going with WWII era tunes instead of honky tonk, said she couldn’t stand it anymore. I enjoyed her selections but couldn’t help but think of the Blues Brothers’ country & western moment. 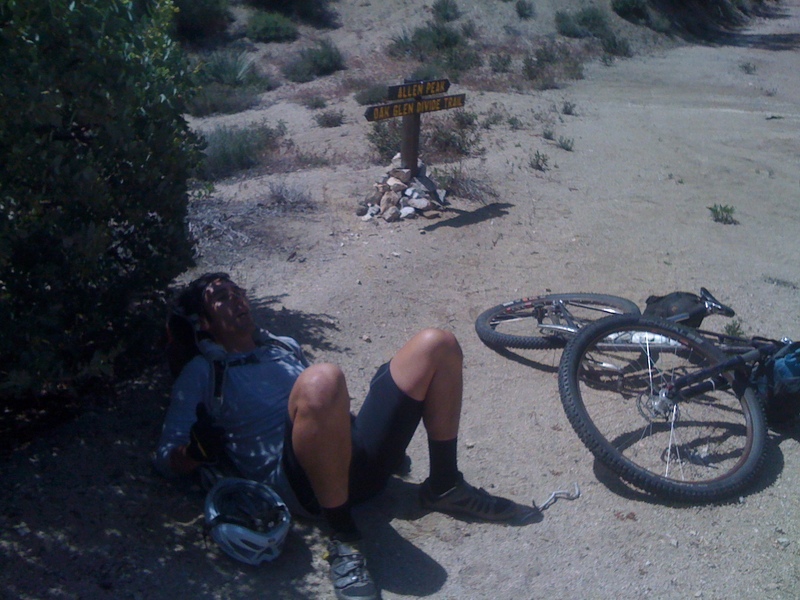 The wind outside howled, we were tired, sore, sunburned, and road (trail) weary. It would be another hour before Yumi would arrive for our pick up… right around closing time. I did my best to charm the waitress, ordered more food.. then cookies.. then coffee in an effort to stave off the check a while. We packed up, headed home, and collapsed into our respective heaps. And I’m still buzzed. awesome adventure!! You guys ever have GPS routes of these posted anywhere? Hey Allison, I’ve been remiss with the blog… apparently for a month! With the bike shop getting its sea legs, the being a dad, etc, it happens. Sorry for that. Anyway, GPS routes are for sissies! Remember?! 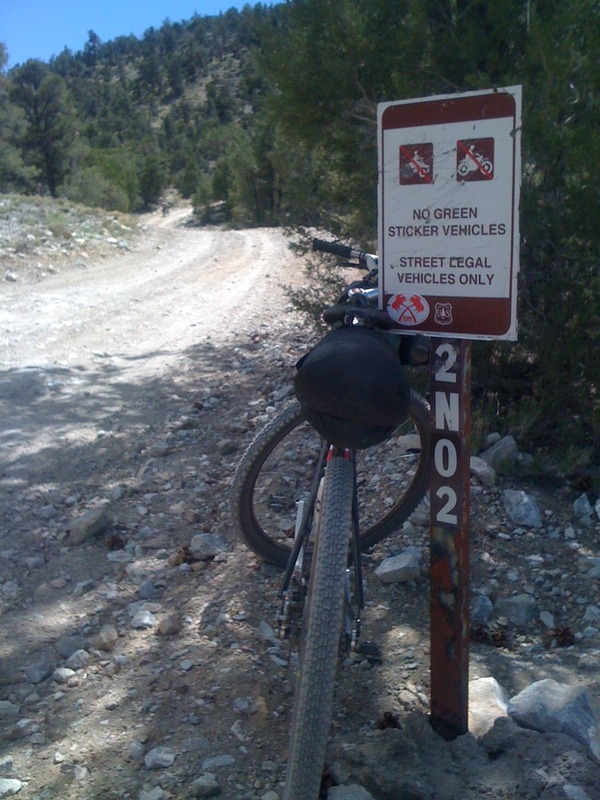 That’s the San Jacinto Enduro Gospel. But aside from the sissiness of using GPS, the route is pretty easy to find on a Gazeteer level map. Just up Burns Canyon, across town, then up ‘n’ over the hump. The latter stuff in the ride is on the San Bernardino overview maps.